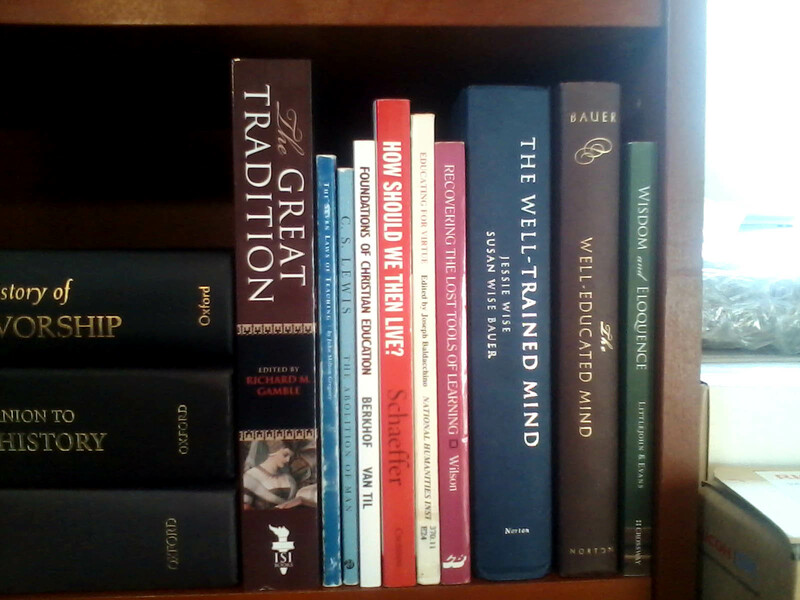 Shelfies III: What Do Smart Conservatives Read? An avid reader of ILYBYGTH, I am probably atypical in that I read this blog not so I can understand conservatives, but so I can find out how liberals understand me. So when Adam asked his readers to send in shelfies, I thought it might be beneficial for others to see what conservative Christian educators like myself have been up to lately in our reading habits. Here’s a sampling of ten books from my shelves that have influenced me over the years, and that anyone interested in unraveling the mysteries of conservative Christian educators would do well to explore. Richard M. Gamble, ed., The Great Tradition: Classic Readings on What It Means to Be an Educated Human Being (2007) – Whether motivated by historical curiosity or a search for wisdom (or both), anyone interested in education will find a rich resource in this 500 page anthology. It features selected writings by Plato and Aristotle, Augustine and Aquinas, Luther and Calvin, Albert Jay Nock and C.S. Lewis, and many more. John Milton Gregory, The Seven Laws of Teaching (1885)– This book is required reading at the school where I teach. Although its terminology is a bit dated (the principles of pedagogy are described as scientific laws—how 19th century! ), the principles are as powerfully applied today. There is an interesting story behind this book. Gregory, a university president in Illinois, wrote this book with Sunday School teachers in mind. Then, in 1917, a new edition was published, stripped of all references to the Bible. The book later became popular among Christian educators, who used the abridged version for years before bring pleasantly surprised to discover an original edition. A new edition was published in 2004 by Veritas Press, with the religious language restored. C.S. Lewis, The Abolition of Man (1943) – Lewis wrote over sixty years ago, but the problems that he identifies with education sound just as relevant as ever to a good conservative like me. Is there room left, in a world obsessed with progress, for traditional, universal values, or for God? Or, as Lewis argues, do we rid ourselves of these things do our own detriment? The Abolition of Man explicates a philosophy that Lewis explored elsewhere in his fiction, such as in his Space Trilogy. Louis Berkhof and Cornelius Van Til, Foundations of Christian Education: Addresses to Christian Teachers (1990, from lectures originally delivered and published in 1953) – The writing is a bit dry (okay, really dry), but anyone who wants to understand why some Christians (and Calvinists in particular) insist that education cannot be religiously neutral should consider reading this book. Francis Schaeffer, How Should We Then Live? The Rise and Decline of Western Thought and Culture (1975) – Like many evangelicals, I have been enormously influenced by the work of Francis Schaeffer in the way I think about culture. Also like many evangelicals, I disagree with many of his conclusions while still being deeply inspired by the monumental task he took upon himself of evaluating the cultural and intellectual history of the West from a Christian perspective. This book is accompanied by a quirky ten-part video series now available on DVD, parts of which I show to my high school students from time to time. Joseph Baldaccino, ed., Educating for Virtue (1988) – This book features essays by various conservative authors like Russell Kirk. They mourn many of the developments in education from the past century and focus on restoring the role of moral formation in literature and history classes. Douglas Wilson, Recovering the Lost Tools of Learning (1991) – Spinning off of Dorothy Sayers’s essay “The Lost Tools of Learning” (1947), this book begat the Classical Christian education movement. In it, Wilson attempts to lay out a philosophy of education which avoids the Scylla of academic rigor without God and the Charybdis of anti-intellectual Christian fundamentalism. Put it on your must-read list if you want to understand current trends in Christian schooling. Wilson’s influence, along with the Association of Classical & Christian Schools (which he helped form) has been profound. Susan Wise Bauer, The Well-Educated Mind: A Guide to the Classical Education You Never Had (2003) – Writing for adults in this book, Bauer guides her reader through the classics, offering advice along the way on the skills of journaling and of asking critical questions of the texts. I especially enjoyed her historical surveys of the development of various literary genres (including the novel, the poem, autobiography, drama, and history writing). The goal of the book is to help prepare readers to go on to read the classics on their own, many of which she recommends and summarizes to get readers started on their journey. About the author: Patrick Halbrook teaches at a classical Christian school near Raleigh, North Carolina. His research interests include the history of Christian education and the intersection of science and religion, and for his master’s thesis he explored the role of the Scopes trial in American memory. You can reach Patrick at phalbrook@carychristianschool.org. Same here Patrick. Thanks for posting. I can’t help but notice the absence of any books on natural science. What reading informs your views this subject? Does any author you know make a reasonable case against the universally materialistic explanations of modern astronomy, geology, and biology? In particular, do you find any of books from the Discovery Institute worthy of reasoned consideration? I have mixed feelings about the materials I’ve read from the Discovery Institute, but I like Alvin Plantinga quite a bit and think his Where the Conflict Really Lies is an important book (as does Thomas Nagel). I also find John Polkinghorne’s work intriguing, though I’m not a fan of his open theism.